I am a natural blonde but have been having my hair bleached and toned to an ashy/silver shade for a few years now. Silver and grey hair is becoming more and more popular but there are a few things to consider if you are thinking of having your hair this colour. I would say the main 2 negatives are that 1. Bleach isn't very good for your hair and can make it look dry and unhealthy and 2. The upkeep of making sure your hair doesn't dull and remains that gorgeous silvery platinum. 1. Don't DIY. 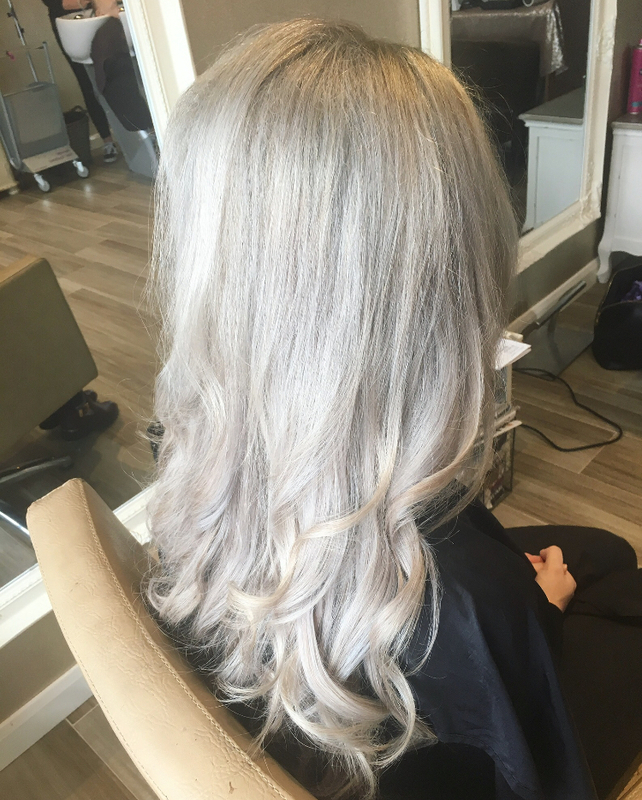 I always go to my favourite salon to get my hair coloured and have never personally attempted to go silver with a packet dye. 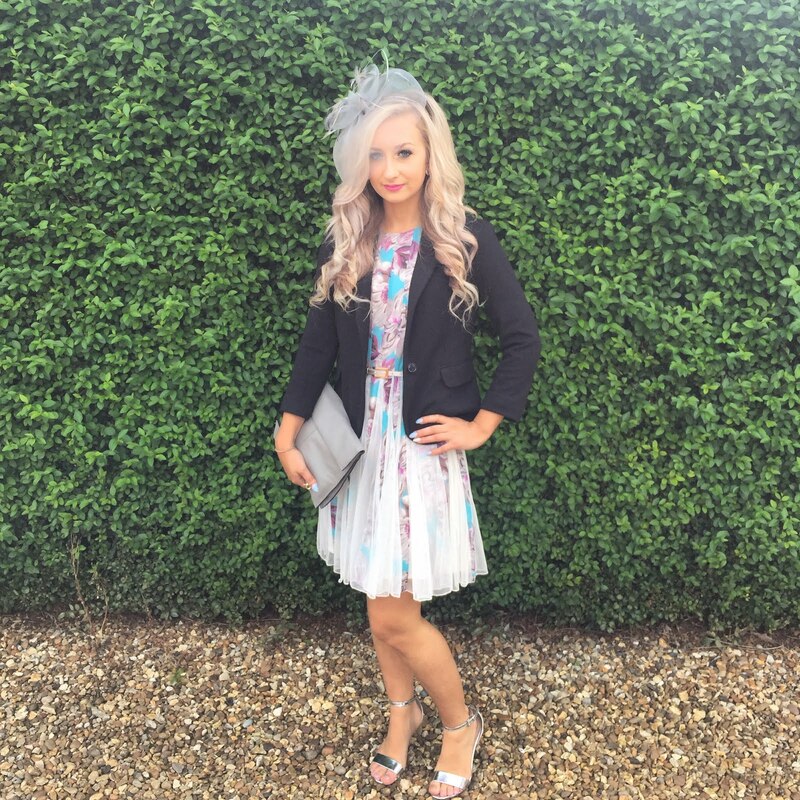 I would always recommend going to a professional as I have seen too many times where a girl has patchy bleached hair where some parts are brassy yellow and other parts are white! My hairdresser bleaches my hair in foils before using a toner to get it that extra bright blonde. 2. Purple Shampoo Is Your Best Friend. 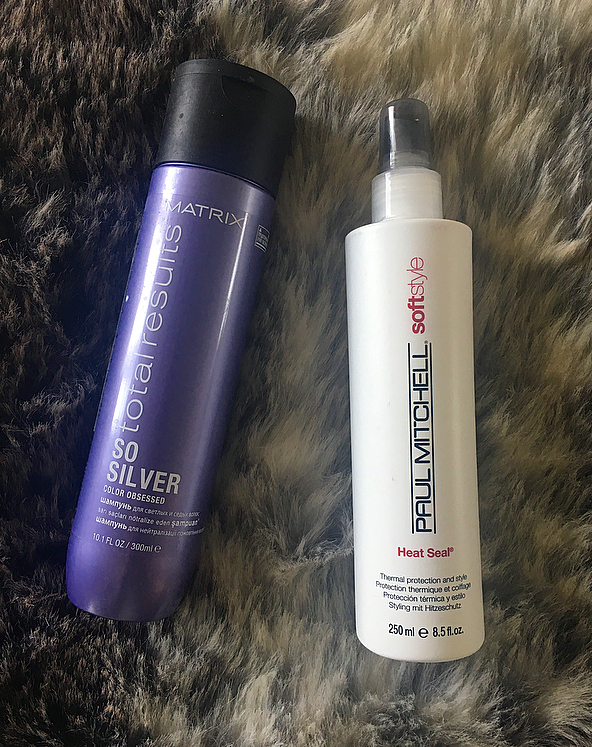 Silver and Platinum hair dulls fast, it doesn't necessarily fade. Using a purple shampoo once or twice a week will keep it bright and will remove any brassy tones that may still remain. Be careful what ones you use though, as I have found some that just turn your hair purple! My favourites are always from the brand Matrix. The one I am using now can be found online here* and is pictured below. 3. Look After Your Hair. To go this shade your hair will need to be bleached. We all know bleaching is not good for our hair so we need to make sure we are looking after it. Regular trims to remove any split ends and using a good moisturising shampoo & conditioner, or one suitable for coloured hair will help to keep it from drying out too much. 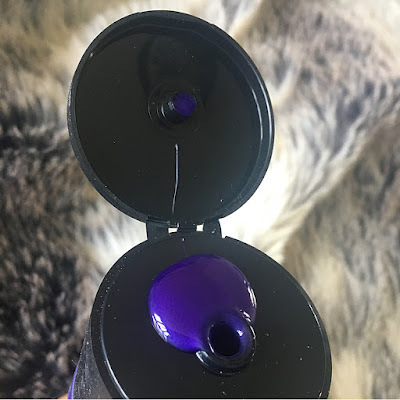 You also want to remember your heat protection products to prevent it from drying out even more, my current favourite is the Paul Mitchell Heat Seal* available online here and is pictured below. I hope these have helped anyone wanting to try out this hair colour! If anyone has any of their own tips on healthy bleached hair then please leave a comment!